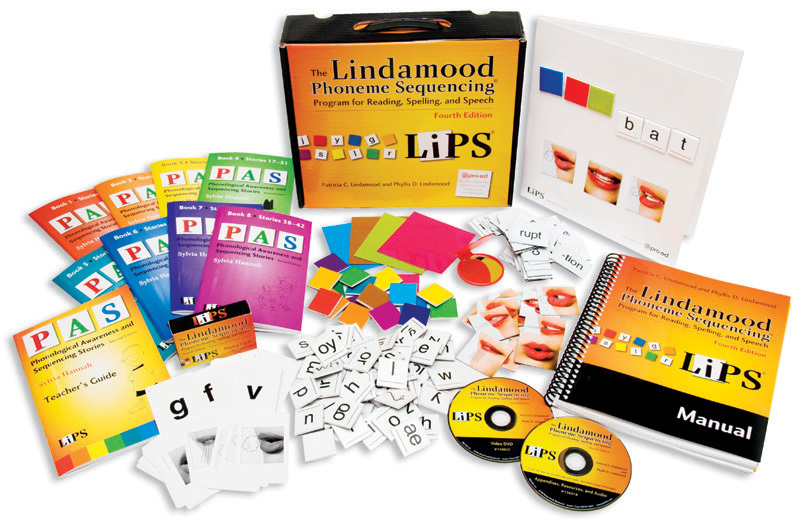 The LiPS: Lindamood Phoneme SequencingÂ® Program for Reading, Spelling, and Speech- Fourth Edition is a comprehensive multisensory program that uses explicit, systematic instruction to develop phonological awareness, decoding, spelling, and reading skills. The goal of LiPS is to develop fluent readers and competent spellers. The LiPS Program steps are: Setting the Climate for Learning, Identifying and Classifying Consonants, Identifying and Classifying Vowels, Tracking Simple Syllables and Words, Basic Spelling and Reading, Learning Sight Words and Expectancies, Tracking Complex Syllables and Words, Multisyllabic Words, and Reading and Writing in Context. To teach sound-letter associations, the LiPS tasks progress from articulatory movement to sound, then to letter. Through guided discovery techniques, students explore the physical movements involved in producing sounds and learn to hear, see, and feel the physical characteristics of sounds. This in-depth knowledge leads to the student's ability to understand how words are constructed and to self-correctessential skills for independent reading and spelling. For more than 40 years, the LiPS program has successfully addressed the reading difficulties of a wide range of individuals, including students with functional speech-language delay, second language learning, dyslexia, autism, apraxia, pervasive developmental delay, traumatic brain injury, and stroke. The program's use with students in grades K-3 has been shown to significantly reduce the need for remedial reading instruction. LiPS can be used with individuals, small groups, and classrooms. It can be used with all ages, from preschool to adult. The revised Lindamood Phoneme SequencingÂ® Program for Reading, Spelling, and Speech - Fourth Edition Manual provides theoretical foundations and a detailed description of the LiPS Program steps. The main parts of the manual include: introduction to the Program, identifying and classifying speech sounds by place and manner of articulation, simple syllables and words, complex syllables and words, spelling, and reading, multisyllable words, and reading for comprehension and spelling in context. The manual includes outlines and sample dialogue to help students develop phonemic awareness and abilities in reading and spelling. A flashdrive accompanies the manual and includes extensive dialogues, chains and word lists, frequently asked questions, and audio and video examples. The eight book set of the Phonological Awareness and Sequencing Stories (PAS) is now integrated into the LiPS Program. These 42 appealing stories, organized into eight chapter books, follow the Vertical Path of sound introduction and have engaging illustrations to give the students opportunities to practice successful reading. A separate Teacher's Guide is available. COMPLETE LiPS KIT INCLUDES: Manual with Flashdrive; 15 Mouth Picture Magnets; 21 Small Colored Squares Magnets; 53 Letter Magnets and 3 blanks; 4 Large Colored Squares Magnets; 60 Syllable Magnets and 4 Blanks; 11 1/4" x 30" White, Tri-Fold, Magnetic Write On-Wipe Off Board; 64 Playing Cards; Folding Mirror; Phonological Awareness and Sequencing Stories (set of 8 books) and Teacher's Guide.